Swedish death metal band Tribulation formed in 2004, following a project that involved three of the band’s members that began in 2001. The band continue to evolve with each album they produce, with debut album The Horror released in 2009, followed by The Formulas Of Death in 2013 and The Children Of The Night in 2015. The band state that there are elements from all three of their previous albums on the new record Down Below, “but with a new flavour”, before touring their new album in February in the UK, supporting Arch Enemy. Tribulation have achieved an incredibly atmospheric collection of tracks with Down Below, with each track adhering to their dark, gothic atmosphere whilst simultaneously displaying their range of songwriting and performing abilities. The album begins with The Lament, opening with a gentle melodic guitar riff of which the minor tones secure the approaching dark themes. The sudden change to the full sound of all instruments throws the listener into the track. The chord progressions and accompanying melodies compliment Johannes Andersson’s growling vocals. Nightbound follows the opening track in a similar vein with the foregrounding of melodic guitar riffs but as the track develops a fantastic minor chord progression ensues. The contrasting riffs, chord sequences, guitar effects and off beat drums in this track create an eerie, unsettling atmosphere. Andersson’s echoing lyrics add to the atmospheric instrumentation leading to a feeling of descending down below. Subterranea, the fourth track on the album opens with a high pitched piano melody, supported by muted strings. This is followed by a build-up of percussion and guitars which imitate the opening melody. The fast-paced rhythm in the guitar chords continues the sense of descension introduced in the previous tracks. The bellowing backing vocals repeating “down below” reinforce the dark themes before the lyrics. The track then ends with the same high pitched piano melody used at the beginning but without the underlying strings. This contrast works effectively and segues into track five, Purgatorio. This track is instrumental consisting of dissonant guitar melodies, eerie background effects that are just audible breaths in the mix. This atmospheric track creates notions of hope being lost in the darkness that is created through the rest of the album. Track nine on the album, Here Be Dragons, displays the band’s skills as they merge different elements together. The track opens with heavy guitar chords, and elements of a snare drum march before swiftly moving into a blues-style piano chord sequence then back to heavy distorted guitars. This fast-changing involvement of music styles transitions seamlessly creating a fascinating track. 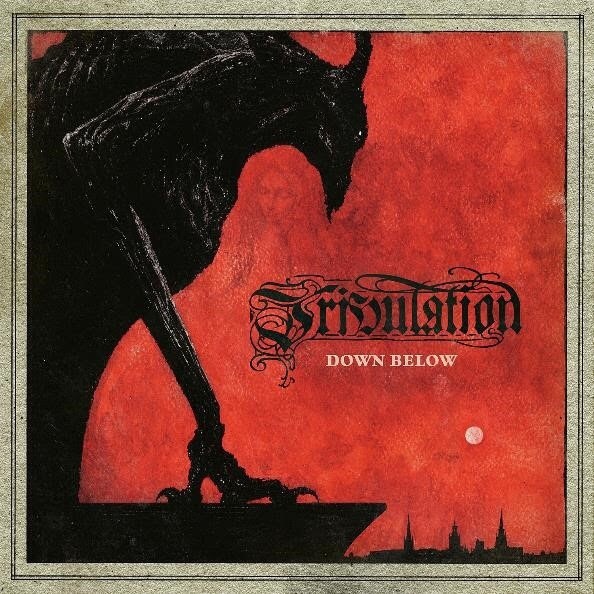 Tribulation have brought an amazing skillset to the table with their latest album Down Below. Their ability to use the instruments to create a detailed range of atmospheres across the tracks, which work cohesively as an album is to be admired. This is a great release for the band and for the genre in general. If 2018 continues with releases like this, it will be a great year for music. ‘Down Below’ by Tribulation is released on 26th January on Century Media Records.